"Little is known about the mysterious German no wave group Didaktische Einheit, but one thing that we can confirm is that they were a fiercely uncompromising band. 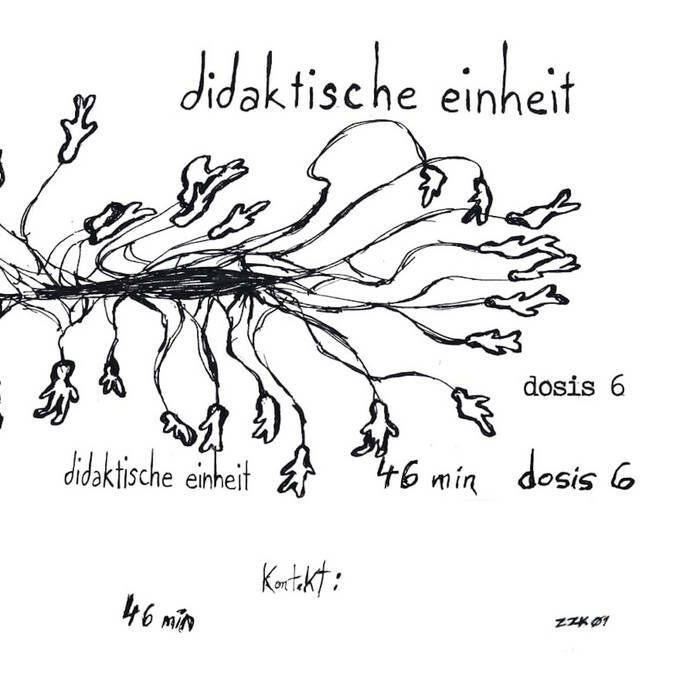 Dedicated to tearing holes in the paranoid fabric of their daily lives, Didaktische Einheit struck upon a sound that fused together every desperate aspect of their creative impetus. Dosis 6 shows this ‘Didactic Unit’ in total control as they veer from the manic rhythms of “Schamtanz” to the ominous electronic throb and chant of “Lebewesen.” “Frommigkeit” slides around the disco in a hypno-gogic trance that PiL would have killed for; “Mutterlieb” follows in a frantic rush of noise guitar and inspired caterwaul. “Stammheim” is an unnerving journey into a madness inspired equally by Amon Duul (the first) and the effect of being surrounded by ruins. On the flip, the gradually building “E-Norm-Ton” resembles nothing so much as Neu! filtered through a river of cough syrup. Dosis 6 wraps up with the menacing flutter of “Vorsorgepaket.” A stunning album, for too long ignored, and now available on a remastered cassette with pro-grade J-card." Limited reissue of 125 copies.